Country charm, fresh produce, quaint cafes and outdoor adventures will all feature in a jam-packed Riverina Murray region special episode of Channel 7’s popular travel show Sydney Weekender, which is set to air this Sunday 24 March 2019. The programme was secured by the NSW Government’s tourism and major events agency, Destination NSW. Host Mike Whitney will anchor the episode from the heart of the remarkable Riverina region in the delightful town of Narrandera; visiting some furry friends at the local Flora and Fauna Reserve and enjoying the grandeur of the surrounding wilderness at Lake Talbot Lookout. Mike will showcase the charming 100-year-old Tall Trees Cottage as the perfect home-away-from-home, and enjoy the abundant fresh produce from Glendale Orchard and Hazelnut Farm. The episode will also give viewers a glimpse into farm life in Wagga Wagga; picking and tasting fresh fruits at Bidgee Strawberries and Cream and making new four-legged friends at the spectacular Belisi Farm Stay. The Ten Mile eatery and Holbrook Bakery will feature as prime spots to pull-in for a bite to eat while travelling on the Hume Highway. With the nearby town of Balranald acting as a gateway to the Aussie outback, Sydney Weekender will also join Outback Geo Adventures to explore Yanga and Mungo National Parks. Destination NSW CEO Sandra Chipchase said promotional activity like this is crucial for showcasing the breadth of activities and experiences available in regional and rural NSW. 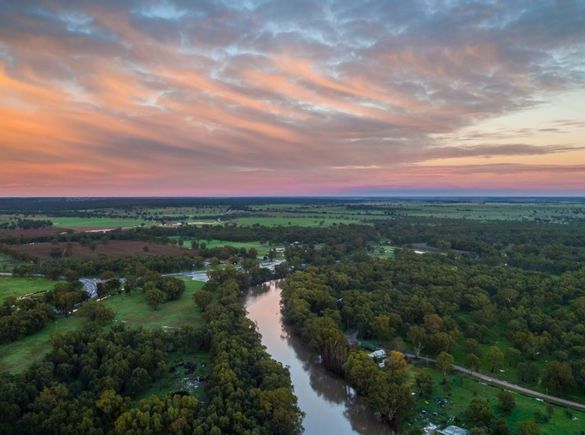 “A the name of Channel 7’s show Sydney Weekender suggests, the remarkable Riverina Murray region is the perfect opportunity to escape the city for a weekend getaway,” Ms Chipchase said. “The NSW Government, through its tourism and major events agency Destination NSW, is determined to keep putting more heads on beds and encouraging local spending in rural and regional areas because ultimately, it’s the entire State which reaps the benefits of tourism growth. Tune into Channel 7 at 5.30pm on Sunday 24 March 2019 to watch the episode.